I must admit that I don’t have a Jamie Oliver cookbook at home, but a friend of mine emailed me this recipe which, she told me, is based on one that the renowned chef thought up while eating mussels in the States. There are probably mussel festivals all over New Zealand to tempt your taste buds with fritters and chowder, but the great thing about this dish is that mussels from the local supermarket are inexpensive and available year round, and it doesn’t take long to prepare and cook. We used local Waiheke mussels and bought enough to serve 4 people. Scrub the mussels and de-beard them. You can always tell when mussels aren’t fresh as it is hard to de-beard them and they often don’t always all open when cooked. Next add the olive oil to a large wok (or big pan, if need be) and then heat until pan is really hot. ?Add your mussels to the wok along with the spring onions, garlic, chilli, ginger, lemon grass, lemon juice, sesame seed oil and coriander. 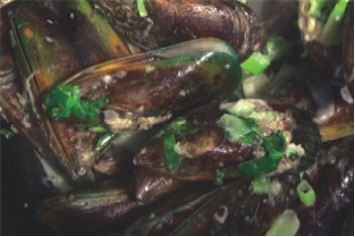 Keep turning the mussels until they start to open – eventually discarding the unopened ones. Finally add the lime juice and coconut cream and bring back to the boil, then add a splash of fish sauce. Serve with a fresh baked stick of French bread and … hey presto!